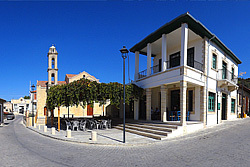 In the village square, one can find, ‘kafenia’, (traditional coffee shops), a supermarket, a bank, bakery, community service, a clinic (once a week), a tavern and the church of Ap. Philippos. 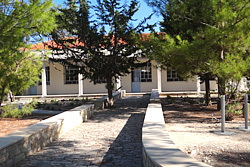 In earlier years, there used to be an elementary school, which has since closed and is used for other function; the children now days going to the schools of Omodos or Pachna. Arsos is well known in the area for its many functions and festivals each time and each one having its own distinctive character. Plentiful water flows all year round from the 6 medieval fountains found west the village. 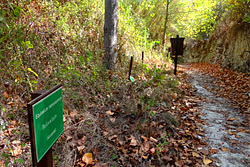 A nature path has been created which connects all the 6 fountains; the visitor following this patch which will come across vegetation particular to the area as well as freshwater crabs and frogs. VRISSI TON ATHKION It took its name from the willows (athkies) which grow all around it. 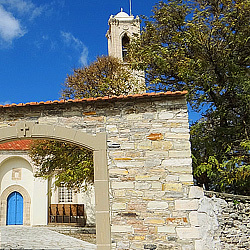 It is at the beginning of the pathway, on the Arsos-Agios Nicolaos main road. Next to the fountain there is a stone bridge which must be saved from the widening of the main road. The enhancement of the site is planned in the future. This fountain was a stop for the passers-by, the mule-drivers, the carters the shepherds etc. ''OSS ARKADJIN'' FOUNTAIN It is a medieval fountain that used to water the orchards of the area in the past. 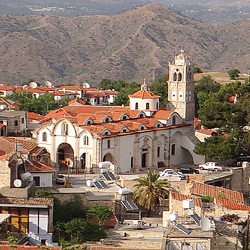 Next to the fountain there is the Byzantine monastery of Panayia Katholiki. 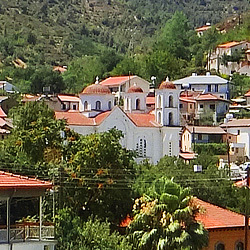 One of the two springs is the ''Holy Water'' of the Virgin. When the weddings were a common phenomenon in the village, people used to wash the wheal (ressi) to the sound of a violin and a lute and afterwards they ground it at the adjacent stone olive-mill. 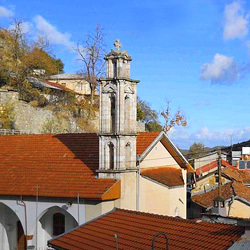 PANO VRISSI It is a building of a remarkable medieval architecture with a vault. 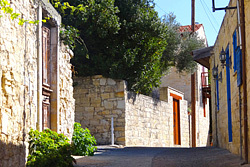 It is linked to the village by a beautiful cobbled pathway and leads to the Nature Trail by a wooden staircase. Here, the women of the village used to wash the linen with clean soot until the beginning of the 1950's.They also took drinkable water from it. KOSTENA A medieval fountain similar to the one above, which was unfortunately destroyed at the beginning of the 1970's to become a water tank. Today, only its foundations remain. It was used for washing the linen. It has plentiful cold water. Our objective is to restore it. KOUPAS This is a small source with basins. Next to the rock where it stands, there are stalactites. It was mainly used to water animals. TO POULIN This ancient fountain has two arches and plentiful cold water. Old inhabitants of the village remember the blazon wich represented an eagle with closed wings (the blazon of the Ptolemy - Arsinoe) which is no longer there. All the fountains are linked to the village by a separate path. 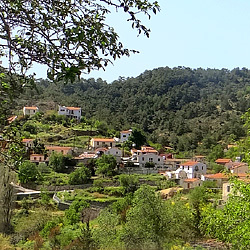 On the western fringes of the village of Arsos, on a relatively steep slope, there is a narrow valley with a stream in which plentiful water runs all the year round, and which is a tributary of Diarizos. In older times, when the village used to throb with life (until the 1960's) this river watered the small orchards of the inhabitants of the village. Along the river, tens of basket makers used to dig ''kolymbous'' (smalls dams) for the ''liathkia'' (reeds) they used for making the baskets. With the rural exodus, only a few orchards are maintained and wild vegetation (especially brambles) has covered its riverbed. It has a rich flora, such as plane trees, willows, poplars, walnut-trees, and willows (41 species in total). As regards the fauna, soft water crabs, frogs, foxes etc., endemic and migratory birds, rare species of butterflies and insects have been preserved. Along the river and at a distance of about 800 meters, six medieval fountains are built. These fountains played an important role for the inhabitants of the village at times when there was no running water in the houses. They were a source of life for water supply and irrigation purposes. Even at times of high draught, plentiful water run from it. References to the big draughts of the 19th century talk about shepherds who brought their flocks to the area from remote villages to save them from the water famine. The Development Association and the Arsos Community Council with the help of the Cyprus Tourism Organisation and the Forest Department, have cleaned the riverbed and built a pathway that links the six fountains. Furthermore, they have enhanced the sites of the ''Ossa Arkadji'' and '' Pano Vrissi'' fountains. The '' To Poullin'' fountain will also be enhanced soon. The extension of the pathway until the Trozena wooden bridge, at a distance of 2 kilometres, is also under study. 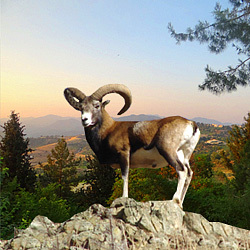 It is a unique biotope both as regards the natural beauty (dams, waterfalls, springs) and the fauna and flora. The houses in the village are close to each other. It is a classical example of a densely constructed settlement. 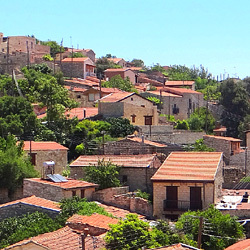 The narrow streets, the lengthy houses (makrynaria), the spacious two-roomed houses (dichora) and the two-storied houses (anoyia), all built with impeccably hewn stones give, in combination with the tiled roofs, give a special charm to the architecture of the village. The numerous neo-classical buildings are also characteristic. 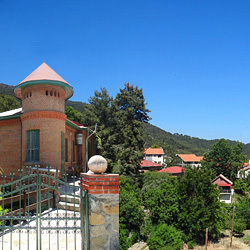 The hospitality of the inhabitants of the village, the cleanness of the houses and the streets, the wonderful picturesque yards and all the varieties of flowers and greenery are characteristic. Arsos is well known in the area for its many functions and festivals each time and each one having its own distinctive character. EASTER With the tolling of the bell one by one the villagers go to church. The procession of the body of CHRIST (Epitafio) through the winding streets of the village, the dying of Easter eggs, the presentation of the Holy Light, the huge bonfire, the games in the central square and the beautiful aromas coming from the cooking of lamb on aspit (souvla) is but a few of the characteristic events that occur at Easter. 15TH AUGUST August Festival The village comes to life again with games, voices and laughter filling the central square. The municipality fo the village is responsible for organizing all kinds of functions, such as dinner dances, theatrical and musical evenings. 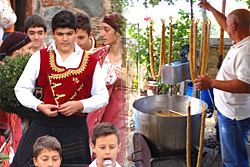 PALOUZES After the grape harvest, towards the end of September, the village organizes the PALOUZES (a traditional dessert made with flour and grape juice and cooked in large copper cauldrons) festival. 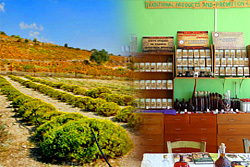 On this particular day, many visitors from all over Cyprus come to watch the making of PALOUZE. The tasting and buying of many of the either products made from grape juice. FEAST DAY OF AP. 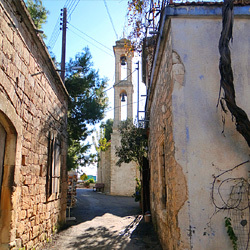 PHILIPPOS- On the 14th of November each year the village celebrates the feast day of the patron Saint of the village, Ap. Philippos. TREE PLANTING- It has now become a tradition that on very 2nd Sunday of January, the planting of trees is organized. All the inhabitants of the village make their own wine, especially red wine, and keep it in big earthenware jars. 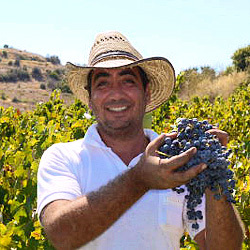 They grow mainly dark grapes, xynisteri, as well as new varieties suitable for the production of wine. 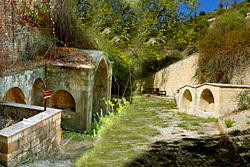 The jars and the winepress for the production of the famous Arsos wine, as well as the alembics for the production of zivania can be found in most houses. 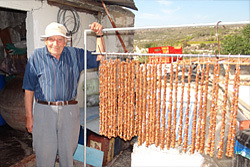 The housewives of the village are famous for their dexterity in preparing the different dishes such as ''palouzes", ''epsima'', ''biscuits with episma'', ''paste'', ''shoudzioukos'', ''kiofterka'', ''arkatena'', ''kattimerka'', '' glyko '' and many others. 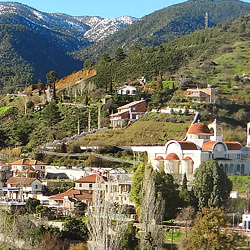 The sun-kissed southern slopes of the Troodos mountains above Lemesos (Limassol) are known as the 'Krassochoria' and are renowned for their vineyards and delightful hillside villages. 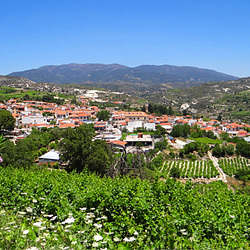 In Arsos village the wine production is still the main occupation for most of the inhabitants. 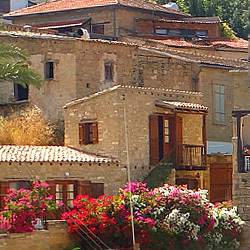 This is the area which produces the island’s famous dry red wine. 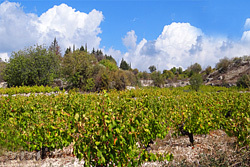 A number of small wineries welcome visitors on wine tasting tours. 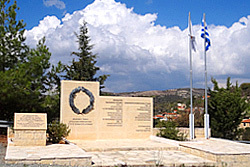 The area is reached from the Lemesos (Limassol) - Pafos road, turning right after Erimi village or from the Lemesos (Limassol) - Platres road. Take a tour of the wineries and in some wine-tasting, or sample other grape-based delicacies. 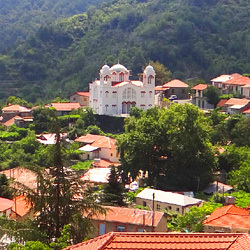 Centre of Traditional Flavours and an Information Technology Centre of Krasochoria (Wine Villages). Kallena Herbs are grown up in the mountains. Earth, sun, water and love-the main ingredients to get the strongest aroma and taste. Would you like to try?